For those who couldn't make it to the recent Basic Electricity event at the Auxxx in Berlin, here are the recordings of my set. 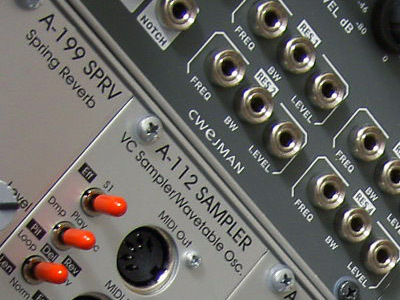 Making their debut at this gig were the Doepfer A-199 Spring Reverb, A-112 Sampler/ Wavetable Osc. & Cwejman FSH-1 Frequency Shifter. They were supported by the usual suspects: RES-4, MMF-1, Toppobrillo Triple Wave Folder & Sport Modulator, Harvestman Hertz Donut, Makenoise Wogglebug and, of course, the EHX Stereo Memory Man w/ Hazarai. Using the Toppobrillo Sport Modulator as a slope detector. One of the most interesting aspects of Mono-Poly's performance at the recent Basic Electricity night in Berlin was his use of slope detectors to generate rhythms. Feeding a pair of Ken Stone/ Elby Designs CGS762s with the outputs of his Wiard/ Malekko Noise Rings yielded unpredictable, yet in sync, patterns. I used an LFO, reset by a clock divider to feed a Wogglebug which sampled the incoming CV at a rate set by a master clock. This CV was sent to the top section of the SM and an inverted version to the bottom. Lag for both sections was @ 2 o'clock. This setting is important as it determines the SM's reaction time and hence the accuracy or otherwise of the resulting gates. When the CV is rising, a gate is output from the top END (left channel), when it's falling from the bottom END (right). In the examples, I toyed with the clock divider's reset, the LFO speed and also injected some chaos via the Wogglebug. As you can hear, this is a great way to generate pulse patterns on the fly. A video compilation of Basic Electricity #1 from Gabor Molnar via Mono-Poly. Richard Scott, Mono-Poly, NAVS at Lichtblick Kino, Berlin 29.07.2011 from Gabor Molnar on Vimeo. Thanks to all who attended and took part - it was a very enjoyable evening. I'll post the audio of my sets soon and look forward to the next event! 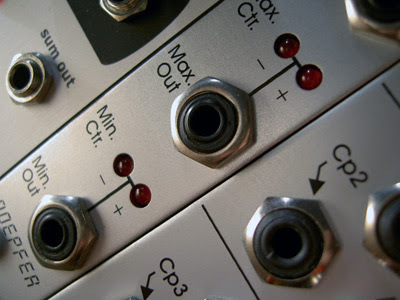 An overview of five balanced-, or ring-, modulators: the Intellijel μMod, Makenoise ModDemix, Fonitronik mh-31, Doepfer A-133 and Cwejman VCO-2RM. 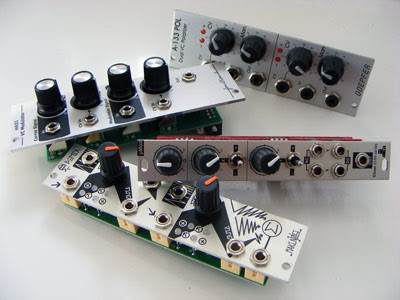 These modules have a different approach, feature set and, as you can hear, sound. The Cwejman is a classic two-input, one output affair and I included it as a reference as it has good rejection and headroom. On the face of it, the additional features offered by each manufacturer set these modules apart. However, given that the basic concept is the same, these differences might not be that wide. The μMod's 'Q' function, for example, seems to be a bipolar offset, something that could be patched externally with the Cwejman or by increasing the manual gain on the A-133. Similarly, the auto-AM/ pseudo-SSB modulation offered by the ModDemix's normalizing could also be covered by a dual module like the Doepfer. Incidentally, it's a shame neither of these dual modules can be used as a mixer out of the box. Pre-patching a signal to one of Maths' attenuverters and using the uni-polar OR output as modulator would yield a function similar to the μMod's rectification switches. The mh-31 utilizes rectification as part of its 'RM' process which might explain its characteristic sound. Two technical points to note: when used as a VCA, the μMod I tested displayed a small amount of carrier bleed (audible in the example above), but I'm sure this can be corrected by calibration of the 'Q'/ offset. The A-133 suffers bleed too, but this is understandable due to its lack of centre-indent pots. At low 'strength' amounts, the ModDemix displays an unusual response - the processed waveform seemed more typical of AM than the 'attenuated' RM I'm used to from the A-133. Both the Makenoise and Doepfer are DC-coupled, so I wonder if this difference is down to the circuit employed. In terms of sound and function, I saw the closest parallels between the VCO-2RM & μMod one the one hand, and the Doepfer & Makenoise ModDemix on the other. The mh-31 is the most unorthodox design and doesn't easily fit in either camp. To my ears, the Cwejman and Intellijel have the cleanest tone, with the Makenoise and Fonitronik well-suited to more abrasive timbres. While not as transparent as the VCO-2RM or μMod, the A-133 can be both clean or driven to distortion. 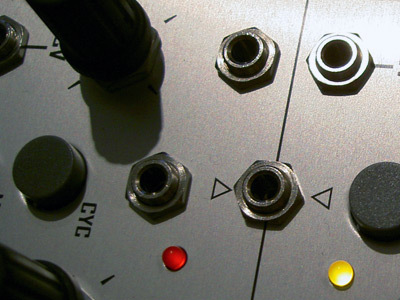 Thanks to Schneidersbuero for the loan of the Intellijel & Makenoise modules. Using the A-172 Min/Max as a voltage limiter. Today's Patch Tip is taken from this discussion on limiting the output of a Wiard Noise Ring. Self Oscillate's suggestion of using a min/ max module is a simple but ingenious solution that deserves re-posting. Not only can it be used to limit the level of a stream of CVs, applying a threshold in this manner can also clip audio waveforms, dynamically if desired. "… feed the NR output to a max/min module, together with a fixed voltage which determines the highest allowed pitch. then use the min output. the higher notes will not exceed the fixed voltage, while the lower notes get through unchanged." As Self Oscillate notes, the benefit of using a min/max module is that, unlike general attenuation, the lower CVs are unaffected. When applied to audio, this results in a 'squaring-off' of the waveform at a pre-determined level. Experiment with the A-172's outputs for positive and negative clipping. I'd previously used the A-172 and Maths' OR output to trace the peak contour of two sources, but hadn't considered doing the reverse. Thanks to Self Oscillate for this useful application of fuzzy logic!